People with dementia should have access to location finding devices – like GPS trackers – so that family carers and the police can locate the person in an emergency if they get lost, according to a new study by the University of Southampton. Of the half a million people in the UK with dementia who live in their own homes, more than 40 per cent will get lost at some point, and about 25,000 will get lost repeatedly, doubling their risk of admission to long-term care. Sadly half of all those who go missing repeatedly for more than 24 hours die or are seriously injured. But researchers believe that introducing devices at a time when a person with dementia is able to appreciate the benefits and consequences of carrying the device, and at a time that will allow them to get used to using the device so it becomes a habit, could save lives. The study, which is being presented in a report to the Alzheimer’s Society, brought people with dementia, their families and carers together with police officers, charities and researchers, to assess the need and impact GPS trackers could have on people’s lives. Part of the study involved talking with people with dementia whilst they were out walking in the community using their location-finding device, as well as sit down interviews with family carers. Using GPS technology was viewed as an acceptable adaptation to aid location for people with dementia, their family caregivers and the police, the report says. The report recommends that individuals and families living with dementia get to know their community influencers; this might be Police Community Support Officers (PCSOs), as they play a vital role in supporting people with dementia to stay safe in the community. Also, PCSOs should receive more in-depth training about dementia and how to support people with the condition and their family carers. Dr Ruth Bartlett, of the University of Southampton, led the study and said: “With increasing numbers of people with dementia living at home and increasing acceptance and usage of digital devices, the use of GPS technologies (amongst others) is likely to expand rapidly. Dr Bartlett added that giving location devices to people with dementia would enable them to have greater freedoms and more independence while providing reassurance to their families and carers. Someone who has benefited from a location device is Steve Bowey from Winchester. Steve was diagnosed with dementia about four years ago and is now cared for by his wife of over 40 years, Sue. Steve has gone missing several times and once got on a bus out of the city. However, having a GPS tracker allowed Sue to locate him quickly and the police to pick him up. The study, which was funded by the Alzheimer’s Society, also involved Hampshire Constabulary, which had already completed their own project called Operation Magnet. Hampshire Constabulary’s Operation Magnet has worked to safeguard those members of our community who live dementia through the use of GPS technology. After a year’s trial in Southampton, the scheme was originally rolled out in areas of Hampshire under Hampshire County Council’s jurisdiction in 2016. The initiative, to provide GPS tracking devices to people living with dementia, has succeeded in keeping vulnerable people safer, and in 2017 was adopted by public protection and care services in the Southampton area. Detective Chief Inspector Dave Brown, from Hampshire Constabulary, said: “As a result of the scheme, we have seen a 65 per cent decrease in the number of people who were given the device being reported missing to police. “This research shows that GPS technology can have a positive impact on people living with dementia. 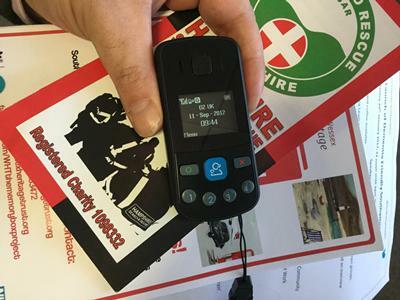 “The technology can help families and individuals make informed decisions to help mitigate the risk posed to people with dementia, and also allows for independence to be maintained whilst giving carers peace of mind. The Southampton research team hope that their report will raise awareness of the benefits of someone with dementia having a GPS tracker and lead to an increased uptake in their usage by individuals and families. Dr Doug Brown, Chief Policy and Research Officer at Alzheimer’s Society, said: “Getting lost is a serious issue for people with dementia and their families - it can put them at risk of harm and reduce their ability to live independently, causing great stress to loved ones, and significant costs to the police. “We funded this research to help the 850,000 people living with dementia in the UK, many of whom have told us how much it means to them to keep their own sense of independence. GPS tracking in dementia has previously been considered a contentious issue, but by listening to the views of people affected by the condition, as well as clinicians and emergency services, researchers on this study concluded that GPS devices can save lives.